Is it a ship from outer space, a colossal yacht that has dropped anchor in Paris, spreading its sails over the tree line of Bois de Boulogne? Or is it actually a “cloud of culture at the Paris sky” as President François Hollande put it in his inauguration speech? 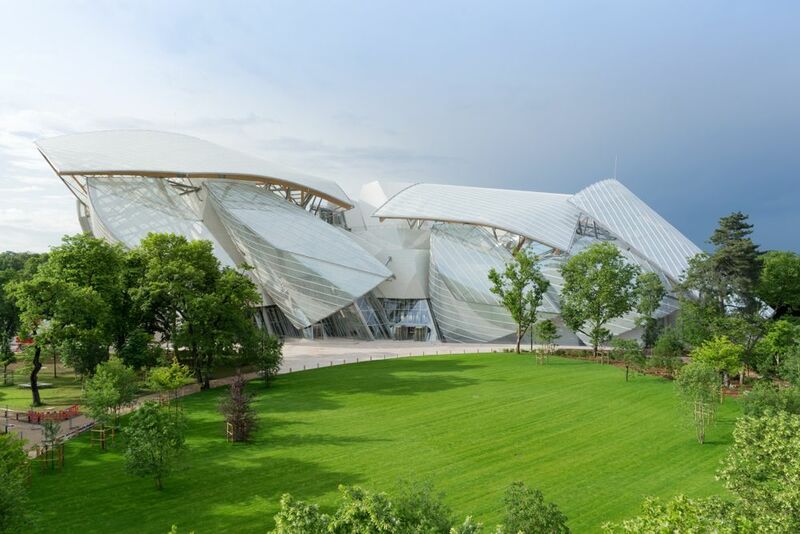 The Fondation Louis Vuitton, a new museum, situated in the Jardin d’Acclimatation in Neuilly, the western, noble outskirts of Paris, definitely is an attraction. Since its opening in October, Parisians desperately try to decipher the new monument in the landscape of the city. Star architect Frank Gehry himself just called it a “magnificent vessel”. Fact is Gehry’s last masterpiece leaves nobody indifferent. Here is the story of the new building: Bernard Arnault, head of luxury group LVMH and the richest man of France, a renowned connoisseur and collector of modern art, simply needed a showcase for his collection. After having visited the Guggenheim museum of Bilbao, he fell in love with Gehry’s work. There might be only a few people in the world, which can afford Gehry. Arnault is one of them. Rumour has it that he paid about 100 billion Euros for this extraordinary showcase of his art collection. The city of Paris left the building land to Arnault for 55 years – date when the whole building will become property of the city, a distant future gift from a rich man. This sounds all wonderful. And all I read about the contemporary art museum was praise and eulogy. The pictures too were impressive. But let me be frank: My visit was a huge disappointment. First of all: this is not Bilbao. From afar the building looks bold and beautiful. It’s intriguing and promising. But once you come closer, the lightness looks heavy, the transparency opaque. They might have employed 200 engineers, developed 30 patens and defied technical infeasibilities, there is something missing at the end. Let’s call it magic. Meandering through the unbelievable enormous and labyrinthic building, I had not a single dazzling moment. Not a second that I had the impressions that beauty and sense come together here. Another thing that struck me: With its 11 000 m2 the building is huge. But only 3 500 m2, a bit more than a quarter, are dedicated exhibition space. This is a choice. But in my eyes it looks like show-off architecture of former times when money was not a problem. But times have changed. The approach looks out-moded. And don’t expect to discover Bernard Arnaults huge collection. Only some paintings of Gerhard Richter, a huge sculpture of Thomas Schütte, a couple of videos and an installation of Olafur Eliasson are on display right now. This was a choice too. 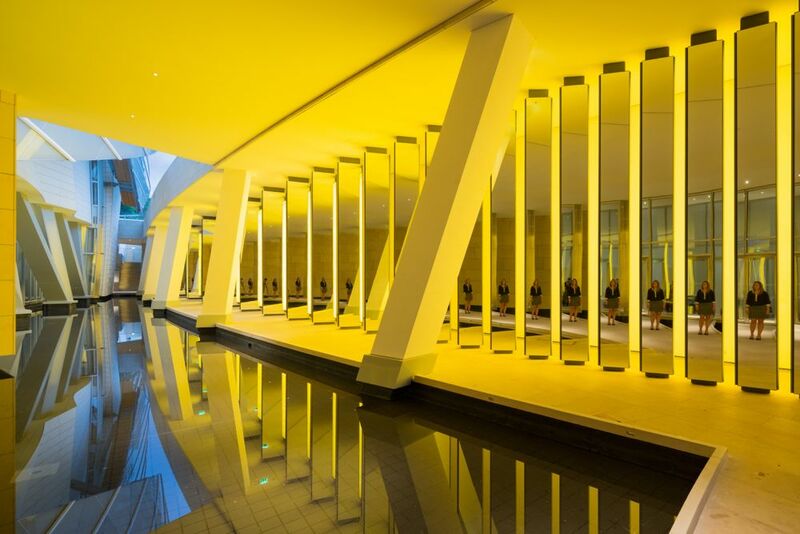 Arnault wants people to discover first the architecture and he doesn’t want them being distracted by too many artworks. I feel unhappy of being choosy and somehow ungrateful: After all, Mister Arnault made an enormous present to the people of Paris. As the state can’t afford those pharaonic projects anymore, we should not complain when private fortune takes over this roll. But still. I left the place feeling somehow uncomfortable. Was it the huge, glittering LVMH monogram that made me feel like this? The Louis Vuitton bag on display in the library? Or just the fact that entrance fees are 14 Euros, 2 Euros more than for the Louvre? 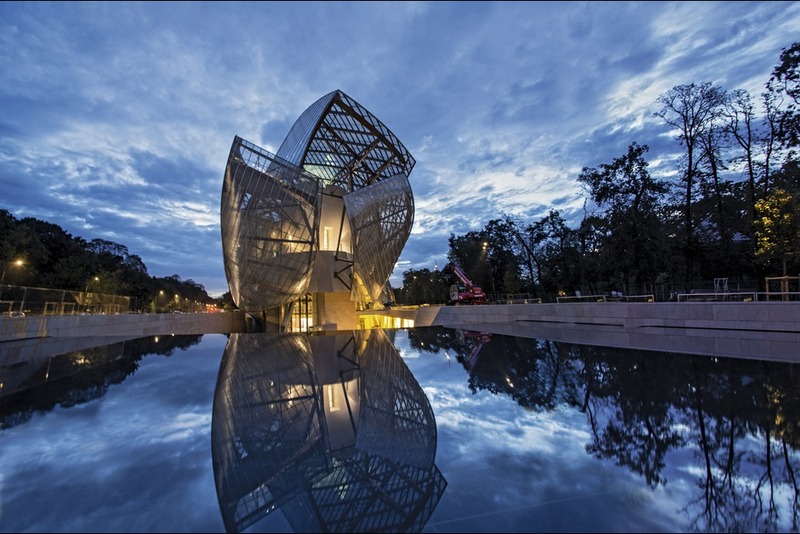 From its size and its ambition the Fondation Louis Vuitton could and should have been a cultural attraction comparable to the Centre Pompidou. I’m not sure that it will keep the promises.